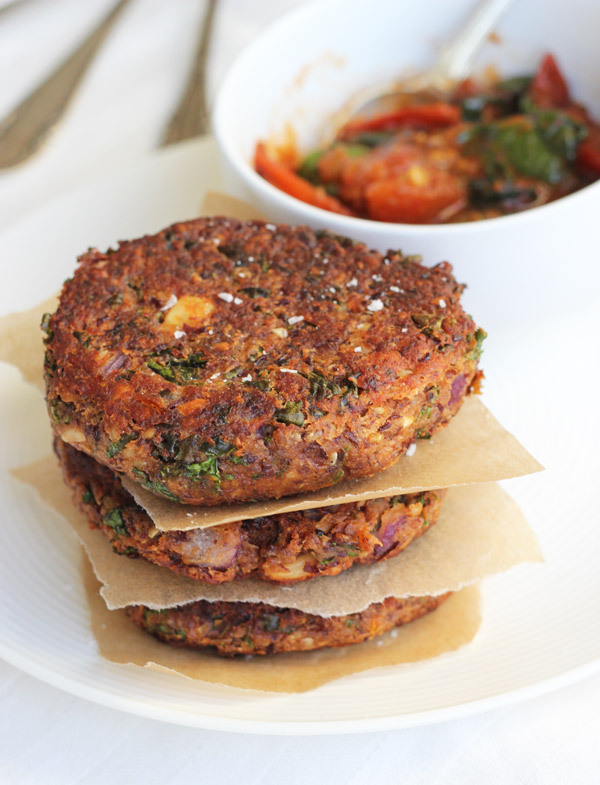 Lets reinvent an old classic, the kidney bean burger. This one is chunky and has a smokey flavour. I use my thick tomato sauce, which I usually use as a pizza base to make it more rich in flavour. Serve with a sourdough burger bread and a homemade vegan mayo to make this burger experience complete. Making these burgers are a perfect Sunday afternoon activity for cold and rainy autumn days. Make a large batch and store in the freezer. Soak kidney beans overnight. Cook as directed on the packaging. Let the beans cool off before you make the burger batter. Add kidney beans, cashew nuts, garlic cloves, pizza sauce, liquid smoke and kale leaves to a food processor. Blend until fairly smooth. Add oil and salt, blend. Taste the mixture, and add more spices or salt if preferred. Mix in chopped onion and parsley to the burger batter. (Do not blend in the food processor). Add cornstarch and work thoroughly into the batter. Then let the burger batter rest for 15-20 minutes. Create burgers, fry in rapeseed oil or oven bake for a low-fat version. Source of amongst other vitamins and minerals: iron, B1, B2, B3, B6 and B9 (folic acid), calcium, and zinc. Easily assimilates flavours from other spices and herbs. What’s liquid smoke, what’s an alternative for it ? Instead of Liquid Smoke you can use smoked Paprika powder to get that hickory flavour. I hope this helps, otherwise just let me know.